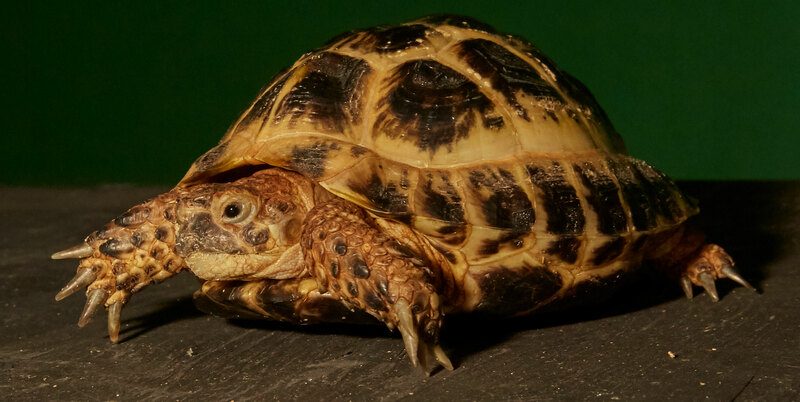 Russian Tortoise | Zoo Med Laboratories, Inc.
Russian tortoises are a great choice for intermediate to advanced tortoise keepers. This species stays small and are very tolerant of cooler temperatures. These personable tortoises are friendly and do well in small groups. As with all turtles and tortoises, purchasing this species is a long-term commitment. Russian tortoises will do best if kept outdoors in temperatures that do not fall below 40°F in winter. If being kept indoors an adult Russian tortoise will need at least a 30 gallon terrarium. Zoo Med’s Tortoise House™ is an ideal enclosure to house this small species. The Tortoise House can be taken outdoors to provide natural sunlight when temperatures permit. Zoo Med’s Tortoise Play Pen™ is an excellent way to occasionally offer natural sunlight and grazing opportunities to your tortoise if being kept indoors. Zoo Med’s Basking Spot Lamp, Repti Halogen™, Ceramic Heat Emitter, and ReptiTherm® Under Tank Heater are good choices for heating Russian Tortoise enclosures. UVB Lighting is essential for Russian Tortoises to process calcium in captivity. Without UVB lighting tortoises will develop serious health problems such as abnormal shell growth and deformities. Zoo Med’s ReptiSun® linear and Compact Fluorescent Lamps are a great choice for providing UVB. The PowerSun® is an excellent way to provide both UVB and heat all in one lamp! Russian tortoises live in arid places in the wild and will do well on a variety of dry substrates in captivity. Create the optimum substrate mix with 1/3 Zoo Med’s Forest Floor, 1/3 Zoo Med’s Eco Earth®, and 1/3 Zoo Med’s ReptiSand® or ReptiFresh®. We recommend providing a deep 3+” of substrate to allow your tortoise to burrow. Russian Tortoises require a high fiber, low protein diet. Zoo Med’s Grassland Tortoise Food™ is an excellent choice of maintenance diet because it offers long stem grasses that are similar to foods available in the wild. It is essential to supplement your tortoise’s diet with ReptiCalcium® and ReptiVite™ as directed to provide balanced nutrition. Fruits should not be offered because natural fruit sugars can cause health problems. Other quality foods for your tortoise: grasses, kale, clover, hibiscus leaves and flowers, alfalfa, hay, red leaf lettuce, romaine lettuce, rose petals, and sow thistle to name a few. Warning: Be sure that any natural grasses or plants offered have not been treated with pesticides or other chemicals. Provide fresh water every day. Zoo Med’s Repti-Ramp™ Bowl makes an ideal water dish that allows your tortoise easy access to fresh water. Treat all water with ReptiSafe™ water conditioner to remove any harmful chemicals from tap water.